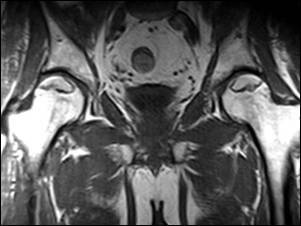 Avascular necrosis (AVN) of the hip is the most frequent site of avascular necrosis. Avascular necrosis (AVN) occurs when the blood supply to the hip becomes disrupted and a portion of the hip bone (femur) dies. AVN is sometimes referred to as osteonecrosis, aseptic necrosis, and ischemic necrosis. AVN is seen with trauma when the blood supply is disrupted. Other times there is no clear reason for the development of avascular necrosis, and it is referred to then as idiopathic. AVN may also be seen with corticosteroid (cortisone) and alcohol use, though why some develop it and others who take cortisone or drink alcohol and do not develop AVN is unclear. Certain disease states such as Lupus, Sickle cell disease, and Gaucher’s disease also have higher associated AVN rates. Impairment to blood flow as in embolisms, thrombosis, and vasculitis will also have higher incidences of AVN. Radiation exposure, chemotherapy, and decompression sickness (Caisson’s disease) also may precipitate the development of AVN. When the portion of bone dies or becomes necrotic, it may collapse leading to accelerated secondary hip arthritis. A goal of management of AVN with the use of stem cell therapy is to try and address the area of ischemic necrosis as well as to prevent secondary arthritis. Many athletes have had their careers ended by AVN of the hip. 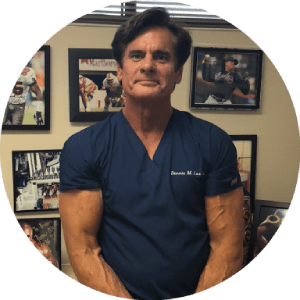 Dr. Lox has treated numerous athletes with hip AVN, as well as other joint areas with AVN by using Stem Cell Therapy. If you wish to consider a nonsurgical option for avascular necrosis or osteonecrosis consult Dr. Lox to see if you are a candidate for Stem Cell Therapy.